We started off our wedding trip on November 8th in the wee hours by driving to Nashville first and staying at the Union Hotel (the grand old train station) and the next day taking a murder mystery train ride for the day out and back to Nashville. The town the train stopped in had a Veterans Day celebration all staged for us complete with GI’s dressed like in the old days. Many of the men on the train were Vets and appreciated the time and effort of the town. We then drove to Gatlinburg and were in a small condo up a hill at light 8 (everything is on which light number you are at) for 4 days until the kids started coming on Thursday, then we moved to the big cabin up a mountain in Ware Valley between Pigeon Falls and Townsend with stunning views and lots of space. 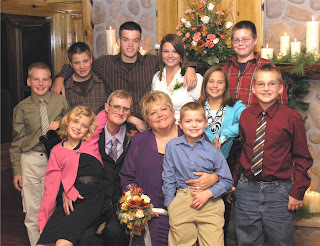 We had 16 of our kids, grandkids and my adopted daughter who is Stacey's best friend Dawn and her family. Everyone got along great, did things together and by themselves, they took turns cooking breakfast and dinner. I had a hand for breakfast one morning turning left overs into breakfast casseroles that were yummy. The morning ritual was gathering in the kitchen and dining room for coffee together and laughing over what happened the day before or when we all were younger. Gary and I took many drives on nature trails and I was busy taking photos and both enjoying the sight of fall in the Smokey Mountains. We were completely turned off by the crowed tourist trap shops that line the streets of Gatlinburg, Pigeon Falls and Sevierville. Gatlinburg retains it charm...but the real beauty is in the nature. We were so close to deer and other critters. We also spent some time in the artisan’s community and fell in love with an artist who draws pictures of the people in the hills...truly amazing. We bought two small pictures one of Miss Emily at 106 and a hermit named Daniel around the same age. Take a look at his work www.paulmurray.com There was also a photographer named Steve Shoemaker who does the most beautiful work...you feel his soul in each one as he is so engaged with the subject he is filming and has Patience to get just the right shot...we came away with cards of his work. You can check out his work at www.mountainvisionsgallery.net. Then there was a small community “Cliff Dwellers” within the bigger one that has excellent artists of all media we stayed and talked with them for hours it seemed. http://www.cliffdwellersgallery.com/index.html We found The Wild Plum tea room and were like a couple of kids, sampling great food and talking with everyone. We have their cookbook and have even traded recipes. We applied and received our marriage license in Sevierville at the court house where they issue an average of 400 licenses each and every week. Gatlinburg is 2nd to Las Vegas in weddings...a very big business for sure. 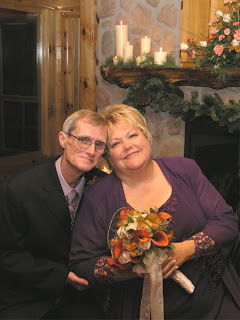 The wedding was on Saturday night November 17th and while set for 6:00 the pastor ended up late to the wedding by 2 hours which also made the wedding dinner at the Park Restaurant back in Gatlinburg late, in fact they kept the place open for us to have the dinner at 10:00pm. What was frustrating was because of the mountains we hardly ever had a signal on our cell phones and with that big family there were many phones to try. We would finally get a signal, call the preachers house and he would not have a signal to answer...and so it went. I had flowers delivered to the cabin for the fireplace, the girls all had cream colored roses, my bouquet was stunning and then of course for Gary. His daughters and grandchildren brought in half the forest so it seemed to add touches of green. The cabin had a Christmas tree up and lit so I added packages for each person that had a sweatshirt I designed, the boys got pocket knives, the girls had Black teddy bears and the grown ups mugs from our favorite potter at the artist community...and of course the book I did for the family and copies of the wedding music. They opened these after dinner (midnight) while having a piece of the wedding cake. The wedding itself was very sweet. We had written our own vows and had not shared them with each other till the time during the wedding. We had a unity candle that was first lit by Gary and I, then all the family there lit their individual candles from it. We did things to unite us as a family. Tears were in eyes, a sense of wonder filled the room mixed with joy. After the I do’s, Gabby one of Gary’s granddaughters said “Goodie now we are official cousins” to Jinny my granddaughter. I gave Gary a beautiful hand made Dulcimer for a wedding gift. He had said he always wanted to learn how to play an instrument. The man who made his dulcimer also had a book where you can learn by number http://www.smokymountaindulcimers.com/ Little did I know he would serenade us at 6:00 am one morning with “Love me Tender”…he had all of us up and in the kitchen early and grumpy till we realized he was playing the song clearly. Of course he thought he was playing softly since he did not have his hearing aids in. We requested that he not play till at least 10:00am and not later than 10:00pm while we were together. The kids did not know who to be angry with, him for paying it so early or me for giving it to him. Angela, Gary’s youngest daughter lead many of the children on long walks to water falls or spots in the mountains each day to keep them interested and tired out at day’s end. They loved it but I do not think she was successful on getting them tired, there was too much to see and do with each other. My kids left on Monday with their families and his stayed on with us. We moved from the large cabin to a motel in Townsend for the last two nights and had Thanksgiving together before leaving on our return trip. We took two days to drive back. The bags are unpacked, wash is done, mail all opened and read and now I am spending time answering several e-mails like yours. Filling you in and sending some pictures along. I have not worked with them yet but at least you will have an idea. Gary and I came down with a flu bug once we were home so it has been a little slow going. When we stopped I guess it all caught up with us. We knew that many of our friends were with us in spirit, both feeling the presence of love in the room with us. Yes indeed we are so blessed…and it is good to be home and in the quiet of our space. Here is a photo of us with SOME of our grandchildren.